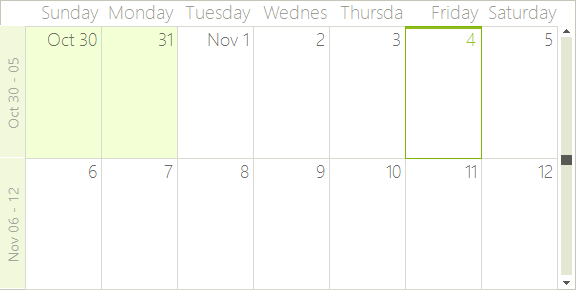 The scheduler displays dates and times using a "view" that can be Day, MultiDay, Week, Work Week, Month and Timeline. The difference between a day view and a multi-day view is that while the day view is constrained to showing a single sequence of consecutive days (for example 7th through 10th, or 10th through 12th, or just the 15th), the multi-day view can display all of the above sequences at once. Change between views by changing the ActiveViewType property to one of the SchedulerViewType enumeration members. Retrieve the view that is currently being displayed by using the ActiveView property, cast it to be the ActiveViewType.